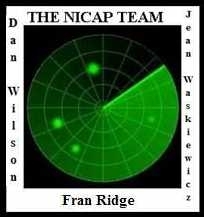 We had discovered this incident and posted it on the NICAP site on Dec. 3, 2003. The backup was provided by a report by Antonio Rullan. Dan Wilson then located 62 Project Blue Book document pages to update this incredible report. This event occurred on the 19th local time, 20th GMT. I think this is one of the most interesting cases I've ever seen. It's a multi-radar/visual/ecm, airborne visual, with scope photos, etc. Also it was part of a pattern of cases over the course of at least two days. And BB was ordered to investigate the case, according to teletypes, by the AF chief of staff, due to pressure from the White House.